My name is Nick Cummins. I’m 29 years old. 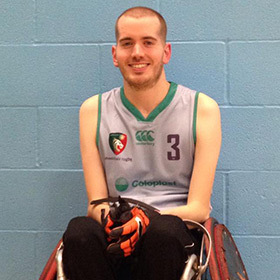 I live in Leicester and play for the Leicester Tigers Wheelchair rugby club and Great Britain. I’ve been paying for about 6 and a half years. In 2005, I had meningitis whilst at university in Leeds. I spent a long time in hospital and when I came out I wanted to find something interesting and active to do. I needed to improve my fitness and my quality of life. I’ve found rugby and not looked back since. I knew the Foundation worked closely with the Tigers and the Tigers Wheelchair rugby club so I got in contact with them. I had a chair that was about 5 years old and it was really hindering my progress in the sport. I was getting bent spindles and other issues and it wasn’t allowing me to progress. I needed a new chair that was the right size so contacted the foundation who very kindly made a large contribution to the cost of a new one which I have now. It’s made vast improvements to my speed, agility and fitness. It’s really helped me solidify myself as a GB player. My immediate aspiration is to compete in the European championship in Finland in September of this year. Then the World Rugby challenge in October in the Copper box. Beyond that, Rio 2016. There’ll be a lot of competition for places so I need to work hard to get in. Hopefully I can continue to progress and play for GB in Tokyo and beyond.